This pair of Abigail Black 10-11 mm AAA Quality Tahitian Pearl Earrings are the perfect accessory to give more elegance and brightness to an outfit, both on special occasions and in everyday life. 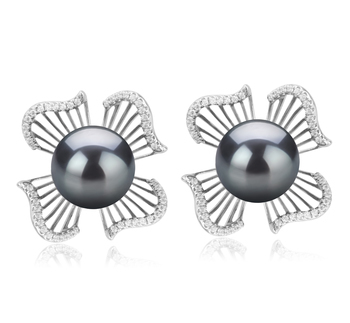 If you are in a need for a pair of long lasting earrings with natural pearls that will catch all the attention and fascinate with their inner light, you are in the right place. 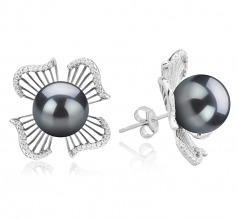 Having that black round perfect pearl on the silver metal makes the pair of earrings mysterious, casual and formal in the same time. The 2.35 grams weight makes them flawless and delicate. The 0.9"" overall length and width deliver a sensual nature to the set. The intense tone of the round .28 grams stone showcases the earrings to their fullest potential. 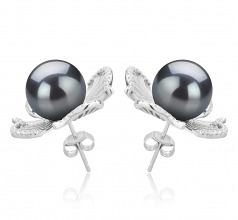 Wearing these Abigail Black 10-11 mm AAA Quality Tahitian Pearl Earrings will make you 100% noticed when entering a room and stepping out without being seen is not an option. 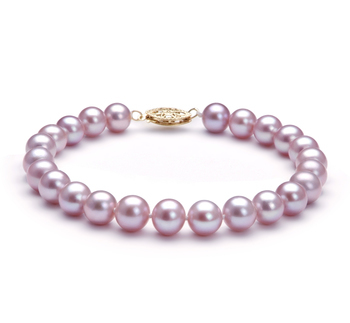 Giving them as a gift for a woman you care about will prove a great and sophisticate taste. Earring are just the perfect jewels for any style. Our collection of Tahitian pearls is so special and appreciated, because they are the only natural black pearls without a painting process. Show only for "Abigail Earring Set"